Closed, now a stained glass workshop. This is a very oddly situated church, along a track across a ploughed field and then over a Victorian railway bridge over the now vanished Witham to Maldon line. The church fell into disuse in the late 19th Century after a replacement was built in the village centre, and amazingly was not declared officially redundant until 1970, the first church in England to be so under the new legislation. By then it was pretty much ruined, as you may imagine. 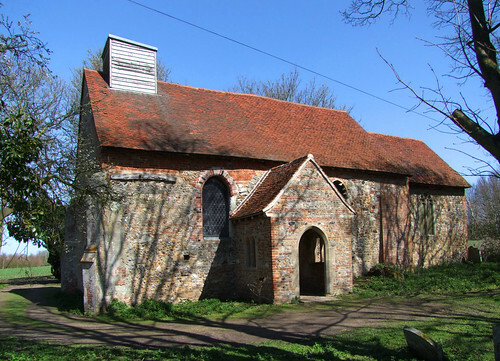 The Friends of Friendless Churches took it on in 1974 and restored it. Recently, a friend of mine was involved in it being let to Benjamin Finn, the stained glass artist, as a workshop, and I was looking forward to using their name as an entrée for a nose around, but the church was all locked up. St Peter has one very odd claim to fame. During the Commonwealth, when the Church of England was suppressed and all manner of weird and wonderful biblical fundamentalist sects were let off the leash by their fascist champion Oliver Cromwell, the intruder minister here was the puritan preacher Joseph Billio, whose sermons were delivered with such speed and gusto that they gave rise to the expression 'to go like Billio'. It must be said that he actually achieved his fame at the nearby Maldon Congregational chapel. Rather a sad little place, despite the restoration. FoFC don't have the resources that the CCT have, and there was still a slight air of desolation about the churchyard, surrounded as it is by as yet unsprung fields. The building looks sound, though. I climbed up the long, steep road into the village itself to this church's replacement, St Bartholomew.